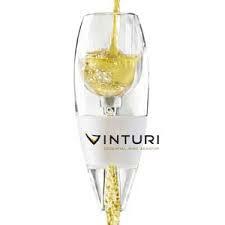 Vinturi White Wine Aerator Giveaway! Here comes a fun giveaway to all my wine lovers out there, or if you know someone that loves wine you could win this fun Aerator from Vinturi. After using this product from Vinturi I fell in love with Aerators. It really does give your wine a different taste and brings out the aromas. Its a fun little gadget to have and enjoy with family and friends that like wine. It’s a longstanding myth that white wine does not need aeration. The truth is that white wine displays the same improvements with aeration as red wine. Vinturi for White Wine has different internal dimensions and flow rates. The result is perfect aeration specifically for white wine. Better Bouquet: Sample the nose. You’ll appreciate the subtle aromatic differences and the full aroma of the wine. Vinturi allows wine to display its intended aromas. Enhanced Flavors: Go ahead, take a sip. Vinturi’s wine tastes better. It is more flavorful and has better mouthfeel. It tastes like a richer, more expensive wine. It tastes like it was intended to and is more enjoyable. Smoother Finish: Ahhhh. Vinturi’s aeration enhances and extends the finish. Any bitterness or bad aftertaste is reduced or eliminated. As the summer months are upon us we all enjoy that nice refresh glass of white wine and why not make even better. 1. Join Homemade Delish and Vinturi on Facebook. Leave a separate comment letting us know you did so. 2. Follow @homemadedelish and @OfficialVinturi on Twitter. Leave a separate comment letting us know you are following if you havent already. The giveaway is open until Friday, May 31st at 11:59 p.m. Eastern time. The giveaway is only open to USA residents. Be sure a valid email address is included with your comment(s). Winner will be chosen randomly and announced on this post. We will email the winner and if the winner doesn’t respond in 24 hours, a new winner will be chosen. Product will be shipped by Homemade Delish. Good luck! Disclosure: This giveaway is being provided by Vinturi, but the opinions are my own. Previous Post Philly Beer Week is Back!! Followed you both on twitter! 🙂 I’ve wanted to try an aerator for awhile. I’ve used the red wine aerator for a long time and it’s great. Didn’t realize they had one just for while wine. We have used aerators at our friend’s house and it does make a difference! Have been meaning to buy one for our own use! Wow, I wish I had known about this give away sooner! Do you plan on doing another one in the future? I’d be interested in doing something like that for my visitors on my blog about wine aeration; did you contact Vinturi directly or was it them who approached you?